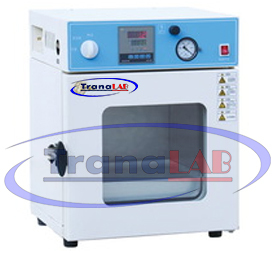 It applies in drying, sterilizing and heat treatment of articles under the relatively vacuum condition in laboratories of industrial mining enterprise, colleges and universities, scientific research institute and medicine and health units etc. The working room adopts high quality and imported stainless steel or cold-rolled steel plate with corrosion resistant. It is durable. The closed door could be adjusted. The complete formed high temperature resistance silicon rubber door-sealing ring could guarantee the high vacuum degree. Double-layer tempering bulletproof glass door is easy to observe the articles in the working room. The rectangular working room makes full use of effective volume. Microcomputer control DD (Digital display) instrument with functions of high precision on temperature control, over- temperature alarm and automatic cutout.